Haven't done a Pretty Sketchy post in awhile, mostly because I had to go back and fix the images on all of the old ones. But I finally found the chance to go back and make with the maintenance, so now we can press ahead. Anyway, I may have actually posted this here at some point in the distant past, but I'm way too lazy to look, and it's not like it would've been an official part of this series, anyway. So, risk of repetition be damned, this is Supergirl by Alex "Box Office Posion, Tricked, Too Cool To Be Forgotten" Robinson, and was acquired as a "thank you" premium for joining the Comic Book Legal Defense Fund while Alex and his wife were at the CBLDF table at the first and only Wizard World Boston show back in '05. He was taking requests, but had a few others that he'd finished in advance, and this one really caught my eye. 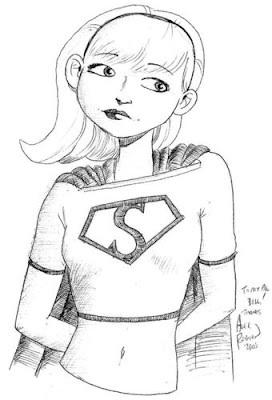 It's just so atypical of the usual depictions of Supergirl you see, and I really dug that. Still do, in fact.